Well made, much better than the plastic varieties. Busy medical environments need high-quality storage solutions and our Dispenser for Aprons On a Roll is a great option. 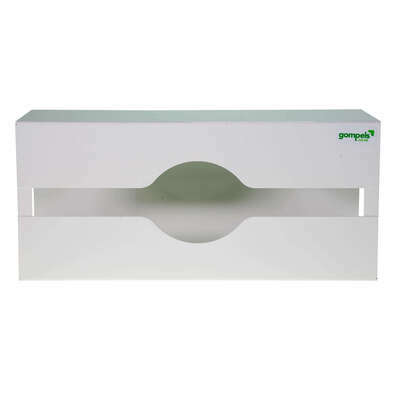 Made from a clinical white powder coated metal, this wall mounted dispenser repels dust and keeps rolls of aprons away from potential soils or spills that could lead to cross-contamination. Holding 1 roll of single-use aprons, the dispenser has been manufactured to allow each apron to be removed through the frontal slot while efficient replenishment takes place through a side panel. This tidy and professional option reduces the need for excessive storage space and keeps your PPE in perfect condition for use. Keep all your essential PPE stored hygienically with our other dispenser options including the Dispenser for 3 Glove Boxes.